Basics, 1/8 inch rug pads provide the ultimate support system for your oriental, Persian, or area rug. Basics, 1/8 inch is 100% felt and rubber rug pad designed for keeping rugs anchored to the floor while providing comfort and cushioning under your rugs. We offer a signature Jet Black natural rubber backing, which combines a full 10oz/sq. yd. of rubber with a reinforced 5oz/sq. yard rubber face to prevent fraying, flaking, and premature wear. Our signature Jet Black backing is combined with a 1/8'' (17 ounce) layer of felt to help support and cushion your area rugs. This dense fiber core helps prolong the life of your area rugs by reducing wear and tear from daily use. This added layer of felt protection also provides insulation, noise reduction, and acoustical benefits. Basics, 1/8 inch works well with all types of rugs, but especially with thinner flat woven rugs such as Kilim, durries, and Sumac rugs. 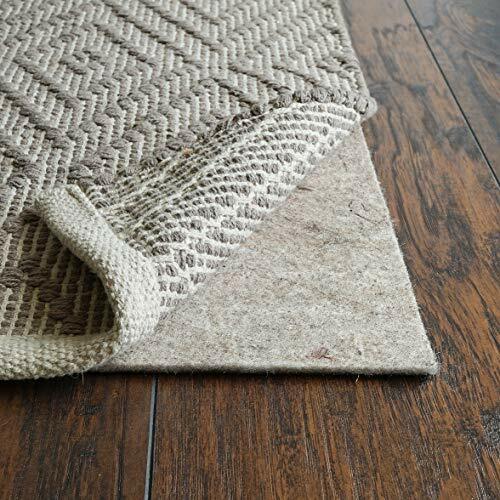 Basics, 1/8 inch is manufactured with 100% felt & rubber and contains no glues or adhesives that can outgas, offering a more natural & eco-safe rug pad alternative to traditional plastic, vinyl, and PVC rug pads. Our felt is heat pressed to the rubber, not glued, for added durability. As the cost of rubber increases, Manufacturers have been using more "classy fillers" in their rug pads to reduce costs. The more classy fillers are used, the faster the rubber backing will fall apart and crumble. The alternative to most felt and rubber rug pads is traditional open weave PVC padding. While more cost effective, these overseas pads can often outgas and may contain potentially toxic chemicals and plasticizers such as phthalates and formaldehyde. Both bad for the environment and bad for your floors, out-gassing from inferior padding can react with certain floor finishes to leave them permanently stained and discolored. Basics, 1/8 inch is manufactured in the USA using only 100% felt and rubber materials. Strong backing - Jet Black natural rubber backing Contains 10Oz rubber sq./yd. W. Additional 5Oz rubber Coat. This prevents pad from breaking Down and while providing more grip for rugs. Rubber backing will not mark or stain floor. Dense felt - available in 3 thicknesses, adds Cushion under rugs while protecting floors from Furniture and foot traffic. For more Cushion, try Our thicker 1/4'' and 1/3'' options. Safe for home - Our felt is tested quarterly by the carpet and rug institute to Ensure low off-gassing and low voc's - hypoallergenic - Mold, mildew and Moth resistant. Made in the USA - we Manufacture all of Our rug pads in Our factory and ship directly to you. By cutting out the middleman, we pass these savings Back to the customer. Purchase confidently - if you are unsatisfied with your purchase, we encourage you to contact US (via Message) and we will be Happy to assist.